Most people never think about what is in their air ducts, yet they should. Air ducts are a critical part of the heating and cooling systems that circulate air indoors. As buildings have been designed for greater energy efficiency, many of the drafts around windows that used to allow fresh outdoor air to enter have been eliminated. The price of this efficiency is that indoor contaminants remain indoors, where Americans spend nearly 90% of their time. Indoor air can be many times more polluted than the air right outside the window. Cleaning the air ducts in your home or office is an important step in keeping your family and workers safe from allergies, disease, and harm. Learn how to choose a cleaner. It is no secret that dust, dander, bacteria and pollen can cause illness and allergic reactions. If these contaminants are in your home or office, they are likely in your air ducts as well. Exposure to allergens in the home has been associated with the development of asthma in small children and infants. When dust and debris clog up the air ducts and the HVAC system, it makes the engine on your furnace or air conditioner work much harder to maintain the temperature set on the thermostat. Clean it all out, and your HVAC system is free to work again at its peak efficiency, so you might see some savings on your energy bills. 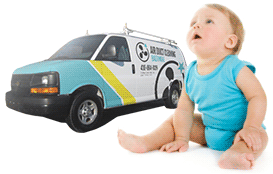 AC & heating systems are very costly. Making sure that the air vents, furnace and return are not clogged and replacing the filters when needed will greatly prolong the life of your AC system. Ninety percent of all AC & heating systems break down due to failure to take these simple measures! A professional air duct cleaning always starts with a video inspection of the ducts, to determine exactly the amounts of dust and other debris we might be dealing with, as well as to check for the presence of mold or rodent infestation. We use top of the line equipment that makes sure we get the full picture of just what's going on in your air ducts so we can act accordingly. Your entire system will get the full treatment. We use our industrial strength equipment to dislodge any and all deposits of dust and debris throughout your air duct system. Upon completion of this meticulous process, we will use our industrial strength vacuum to make sure it is all effectively removed from your air duct system. Some of the parts we will thoroughly clean for you are: The air handling unit, the diffusers & grills, the supply and return air ducts and registers, the heat exchangers, the heating and cooling coils, condensate drain or drip pans, fan motor and fan housing. 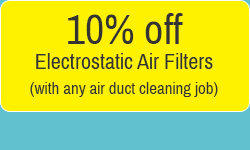 An electrostatic air filter is the right way to keep your air ducts clean and therefore the indoor air you breathe clean as well. They are much more efficient and durable than your standard filters. Another great way to improve the quality of your indoor air, effectively killing off germs and other forms of biological bacteria, is the UV light. Ask your air duct specialist to determine the compatibility of your system with those great, money saving and health improving solutions. From the early 1800's, it was clear that getting your chimney cleaned is important. Even more so in this day and age. We will give your chimney the full treatment it deserves- After all, with your chimney, it's not just about the quality of the air you breathe (although that's always very important) it is also about the safety of your home! Chimneys that are not well maintained can become a real fire hazard. Let us help you keep safe and healthy. When was the last time you looked at your dryer vents? A clogged dryer vent blocks the air flow out of the dryer, which makes it a potential fire hazard! up to 15,000 fires are caused every year by clogged dryer vents. It will also make your dryer have to work longer & less efficiently, greatly increasing your electrical bill and dramatically shortening the life span of your dryer in the process. 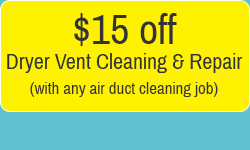 Give us a call today and experience the difference a clean dryer vent can make. Carpet - Check out our great carpet cleaning techniques & special offers! A clean carpet makes for a happy, healthy home! Ask about our special pet stain and allergy treatments! Rug - We have all the answers necessary to keep your rugs free of pets stains & odors, as well as any other type of stain. Area rugs are a vital part of your home's décor, and we will treat them as such. Ask about our free pickup & delivery special! Upholstery - We currently have great deals on offer for our top of the line upholstery cleaning services. 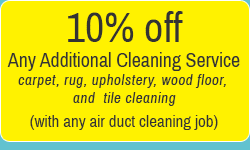 We will help you get your chair or sofa clean, and keep it that way. Ask about our excellent upholstery protection from kids, pets, spills and more! Water damage recovery - Leaks, water damage and flood damage is serious business. That's why you must call on the experts! 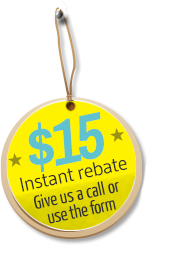 Contact us today to benefit from our vast knowledge and same day service! We will rescue your belongings for you. Wood floor - A well maintained hardwood floor really give your house a touch of class. Wood floors are delicate, expansive business. Contact us and we will make your floors look great, whether it's cleaning, coating or repair that you need, we will prolong the life of your hardwood floor and keep it looking great! Tile & Grout - Keeping your tile & grout in check is a very tedious chore and in fact almost impossible to do without the right equipment. That's where we come in! 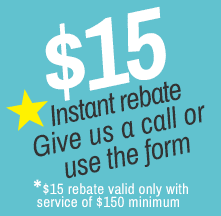 Contact us today to find out about our great specials and maintenance plans. Fill out this brief form. Our staff member will contact you to provide a cost estimate for service.